This New Year has found my focus on the mountains that I dearly love. 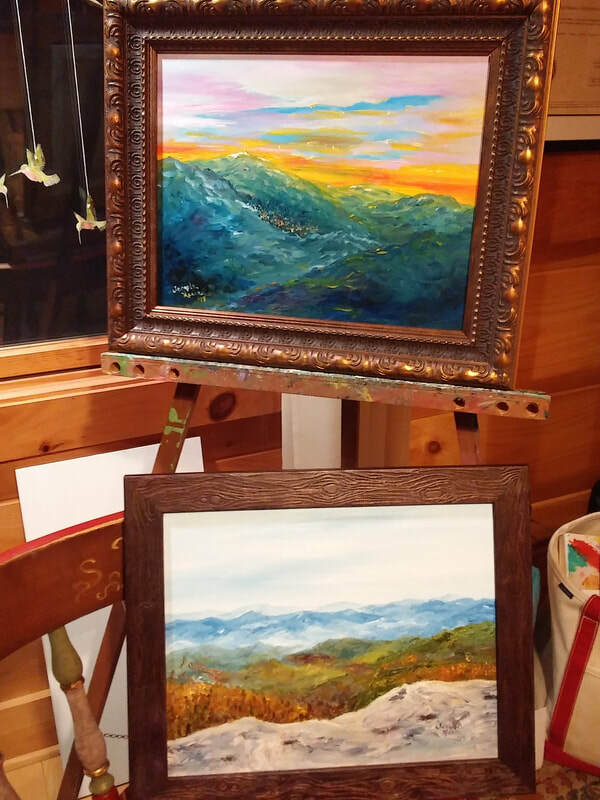 Mike and I saw some beautiful sites on the Blue Ridge Parkway this fall and the mountains are always beautiful where we live everyday. I did a little hike up to Rough Ridge on one of the trips and it touched my heart deeply. I did a painting for Cristy Dunn's birthday and one for the Center of the Art's Heart of the Mountain Show "Resilience" coming in February. The Ascent-The journey up is challenging and rocky. It requires strength and determination. There is a level of excitement, anticipation and wonder. The adventure is wonderful and a beautiful pathway to hold in your heart always. It gives you strength and builds your confidence. The Summit- The mountain top is beautiful, awe inspiring and nourishment for the soul. There is a feeling of victory, accomplishment and renewed strength. The beauty and sense of awe are yours to own forever in memory and in your heart. The Descent-The journey down is difficult, rocky and holds the danger of falling. It requires strength, stability and the use of knowledge and wisdom gained along the pathways traveled in the past. The journey down has much beauty to behold and is a time to take pleasure in the moments and enjoy the beauty. This pathway is a sacred place to hold in your heart forever. The Vale-the bottom of the mountain, the foundation and home is a place to relish in the growth you have made, beauty you have seen, the strength that has grown inside you, the renewed zest for life and optimism and the level of confidence you have attained. It is a place of renewal, strength, faith, hope and joy. It is not the end of your journey but is truly the beginning. After writing this and giving it to Cristy, I was thinking about the "little rock church in the vale" where I grew up in Elk Mills. ( You will see it in my paintings slideshow) I saw a fb post the same day by Kelley St Germain about "going to Church"..he was on White Top Mountain...Amen. The mural was unveiled on September 1, 2018. It was a very special day! 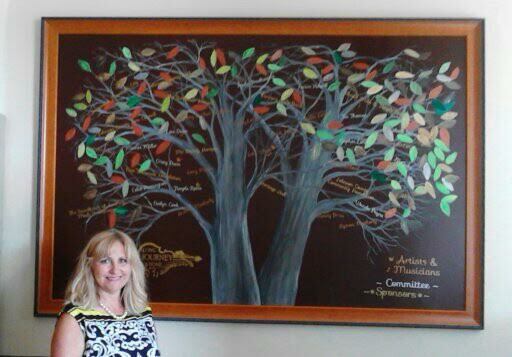 Cristy Dunn and I unveiled the mural as we have the first four. Mike, my husband was there to cheer me on as well as my son and his family and friends. Stephen Long did a great job leading the events of the day. Authors of "The Lopsided 3" and "The Ramblers" were there. Evelyn Cook spoke, Danny Meadows played bagpipes and the JAM kids played as well as our own Long Journey Home group of Stephen, Lois Dunn, Jerry Moses, Kyman Matherly and Kenny Price and friends. Our theme song of "Cloudy in the West and it looks like rain" was very fitting for the day but Andrew Matherly was there to help me unveil my side of the mural and he knew all along that the rain was going around us...and it did. My granddaughter was also standing there with me to pull the cord and let the cover fall to unveil the Lopsided 3. It was a day I will never forget. The mural is an honor to our musical heritage and all the history of trains in Johnson County and nearby. I hope you will enjoy it! I loved painting it! I have been working diligently on a train painting to be used as the reference for this year's Long Journey Home Mural. I have been chosen by Cristy Dunn and the committee to do it. It is a great challenge to paint something that will be comparable to the work Cristy has done on the first 3 murals and the group project of the last one. There is so much to learn and it is so exciting to find out about our not-too-distant history when the trains were a big part of life in Johnson County...and the music that followed...amazing! I look forward to sharing this with those who will enjoy it and to all the new people and experiences that this project brings. It is already happening! It will be great for us and generations to come! ​I am thankful for the opportunity and will do my very best to make it something we can all enjoy and take pride in. It was an honor to be asked by the Center for the Arts Board to do the painting for the very first Collector's Edition ornament. 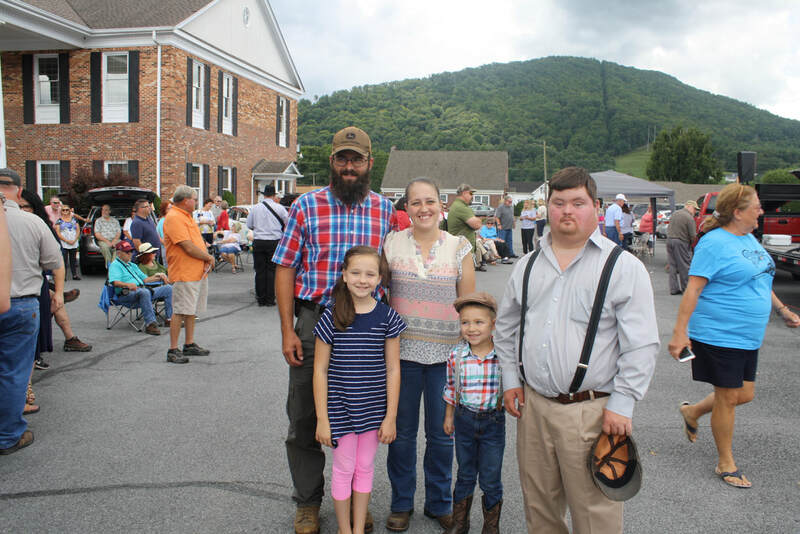 The focus of this year's Long Journey Home is the Fiddlers Convention and Old Mill Music Park is the chosen subject. Proceeds from the ornaments will go to the Center for the Arts and the painting will be donated for the Heritage Hall benefit for the Center for the Arts. Hope you like it!...and it does well to support our Art Center! Each year we will have a new painting and ornament. I have been working on this Summer 2017 Series for the Johnson County Arts Council's Long Journey Home Art Show. It will be held Labor Day weekend at the Library. Hope you like this work. and be sure to be a part of our exciting new Johnson County Center for the Arts!! Happy Summer my friends! 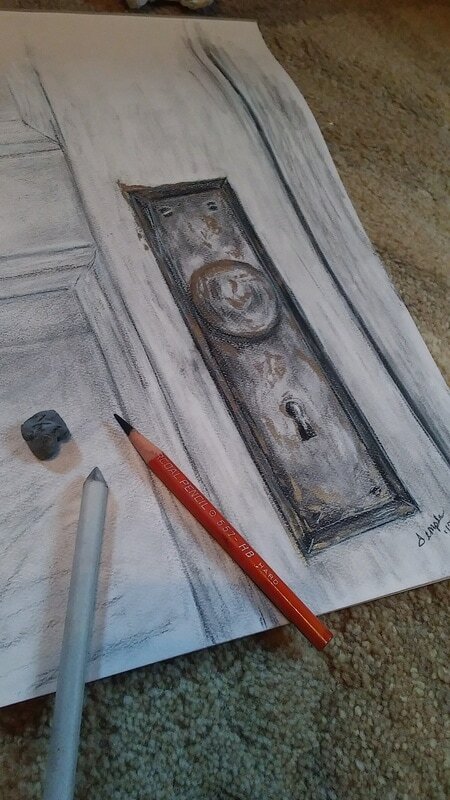 You know I love door knobs... and all the hardware that goes with them. Keys, frames, the screws, old doors...and more. This is a charcoal with some gold paint added after it was completed to add a metallic antique finish. ​It's good to know as an artist, that you can use any medium, any tool, any idea and it is OK ...it is art...your art! Use YOUR creativity and make the art that is in your head! Enjoy! Check out the new Long Journey Home Recognition Mural at the ticket entrance area to Heritage Hall in the Johnson County Adm Building. I appreciate everyone who helped with this and Stephen Long and Mischelle Simcox for providing a space for the mural to "live". Thanks to all who work to make LJH such a success!!! ...donated in honor of the JAM Board and Volunteers for fundraising to enhance the JAM program for our local young musicians. Come to the JAMboree on Tuesday April 18th at Heritage Hall! You will be greatly entertained, support our young musicians and have the opportunity to bid on this and other great items in a silent auction!!!! JAM is such a great program and I am happy to have a little part in helping through the Arts Council as the 501c3 Agency and as an individual artisan that believes in this program and our the good it can do now and for our future. 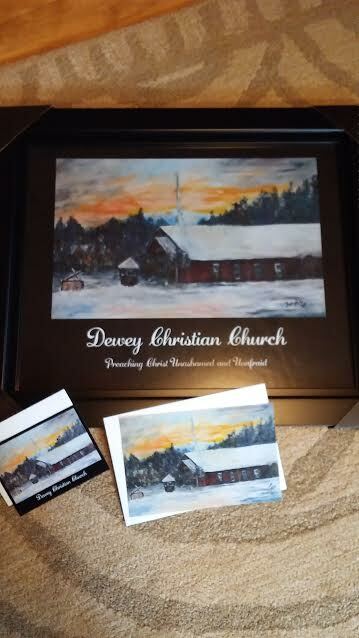 My newest painting is an oil on panel of Dewey Christian Church. It will be somewhat impressionist in nature and will hopefully carry with a sense of nostalgia, family, future and the need for God in our lives. "through my creativity I serve God." ...this a quote that I read often. This gift is for my church family and friends. Well, it took a different turn. My friend Megan had sent a beautiful photo to me that one of her friends had taken of our church one night. It was amazing but the detail was not there at all. I kept coming back to this photo and decided to do a somewhat impressionistic version of our beautiful church. It still needs a little more work after it dries again. "There's Church in the Mornin'"
2/8/17...Well, I came to a stopping point. I've learned a lot and might do a new dandelion painting sometime...or maybe not :). The story... at church, for some strange reason Mike, our friend Gearlene and I were talking about funeral flowers. He said he was going to use dandelions for me. I said, "Oh that's great, next to daffodils, dandelions are my favorite." Gearlene said "Me too!" and told me that her husband Daniel had given her a dandelion on their honeymoon and she has kept it forever. He passed away this past year. What a beautiful story. Dandelions are amazing weeds, flowers or whatever you choose to see. I have always loved them, as have my children, grandchildren and most children I have been around. They are symbolic of purity, life, vitality, positivity, vibrancy, resurgence and survival. The french name means "the lions tooth" and depicts courage, pride, family and the sun. They have tremendous medicinal properties and the bitterness of the leaves has been linked to Christ's sacrifice on the cross. Dandelions in their radiant yellow state and in their "wishing stick" phase bring joy and energy of youth into your life and the message of "Never Give Up". Hope the next time you see one of these little "weeds" in your yard it will make you smile. Someone special needs a painting of dandelions. There is a great story I will share later. I love dandelions in their bright yellow beauty and in their " wishing stick" phase. I've researched the meaning and stories of these beautiful flowers, considered weeds. I'll share that later, too. Right now, I will continue working on this painting. As my friend Faye always said, "everything is equally hard to paint". You would think dandelions would be easy...as you can see...not:) First of all they are not white and the list goes on. When I get it finished, I'll share it...or you will see a panel covered in gesso to start over. 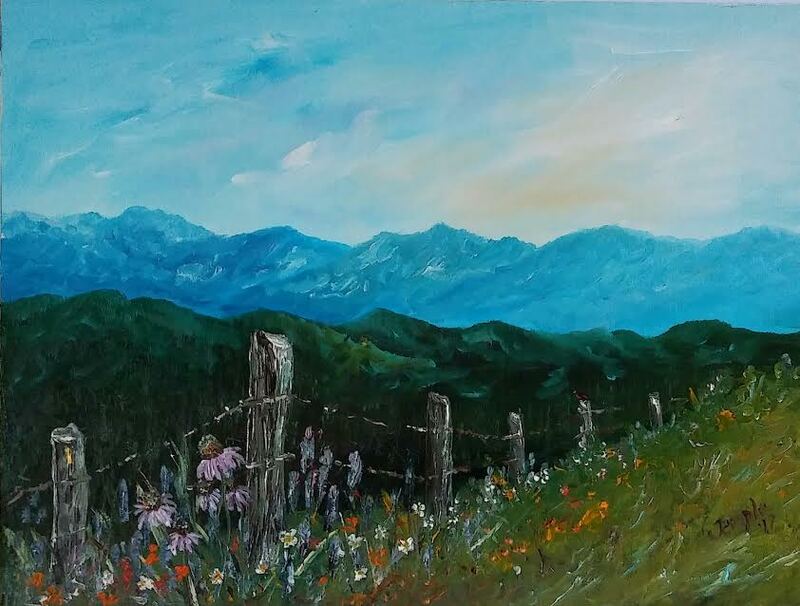 I have always enjoyed the beauty of the East TN mountains where I was born and raised. I am aware of my blessings and appreciate them. My art shares these blessings with others and instills them deeper inside myself.